And you thought the music was a tangled web of who did what. It is, but that opener sounds cool. …It was really that bad? The Sonic franchise has a plethora of characters scattered about throughout its history. A comparatively small selection are still in active use (most of which were represented in Sonic Generations), others were one-offs that are now restricted to mentions and cameos, and then there’s a small sect of characters that were completely cut when Sonic made the jump from 2D to 3D with Sonic Adventure. For fans of these characters, there are often calls to bring them back, and the Chaotix’s redebut in Heroes is cited as to why it’s feasible. But are they comparable, or is there something special about the trio that came back? For this first (and possibly only) edition of Because Why Not, I’ll be covering that central question by doing two simple things; firstly, a collation of classic characters and the company that first introduced them into the series. Secondly, and because it’s a bit more of an ambiguous area, I’ll be working out who created who in Chaotix by individual, and then we’ll go from there to wrap around to the opening thought. So, let’s get to it, it’s quite a mess out there! There’s always something interesting I notice in regards to character creation origins. While the most prominent examples are well known, the more obscure and older parts are either largely forgotten or outright unknown. This can be exemplified more clearly with regards to how people view who made what between the classic games and the more recent games; most fans can easily tell you that the likes of Sonic Chronicles and the All Stars Racing series were outsourced, but not as many can tell you the same of Sonic Triple Trouble or Tails Adventure. It is often assumed that most were made under Sonic Team’s eye when the reality is that they had a hand in surprisingly few of them, although most were still kept within other branches of SEGA. So with this in mind, here is a rundown of each of the characters that existed prior to Sonic Adventure, and the company that first introduced them. If we know anything about who created them, they will be included. Sonic the Hedgehog (Sonic the Hedgehog) – Sonic Team. He was famously created by Naoto Ohshima as part of internal deliberations between several staff. The hedgehog was picked due to exemplifying the ball mechanic and being very streamlined in look. It has inspirations from Bill Clinton and Santa Claus, apparently. Dr Ivo “Eggman” Robotnik (Sonic the Hedgehog) – Sonic Team. He was also created by Naoto Ohshima, but his design was one of the early protagonist designs before it was re-adopted for the main antagonist. Apparently takes heavy influence from Theodore Roosevelt. The Ivo Robotnik name didn’t exist in Japan until Sonic Adventure as it was conceived solely for localisation. Miles “Tails” Prower (Sonic the Hedgehog 2) – SEGA Technical Institute (The part which was effectively the main Sonic Team unit between 1992 and 1995, although other parts of it made spin-offs like Sonic Spinball and the vapourware Sonic X-Treme). The fact his design process was similar to Sonic’s is less famous, but the kerfuffle over his name is still pretty well known. Creator credit is given to Yasushi Yamaguchi, would was insistent on using the name Miles and managed to get a compromise on it. It’s almost like one of those “this is how I see me, this is how other people see me” virals. Amy Rose (Sonic CD) – SEGA Enterprises (who aren’t Sonic Team, but had one or two key staff). Game creator credit is with Kazuyuki Hoshino. She’s based off a character from the 92-93 Manga, but the design is a combination of Hoshino’s preferences in women at the time and Ohshima’s fashion preferences. Metal Sonic (Sonic CD) – SEGA Enterprises. He was also created by Kazuyuki Hoshino, and he has some very detailed technical aspects to his construction available. All characters from the Sonic the Hedgehog cartoon and Adventures of Sonic the Hedgehog (Sonic Spinball and/or Dr. Robotnik’s Mean Bean Machine) – DiC, not a game team. It is important to stress that it doesn’t mean that DiC owns them, it just means that DiC made them. And the reason why it’s not separated into two different points is because Scratch is the only character to feature in both games. There’s a bit of trivia for you! 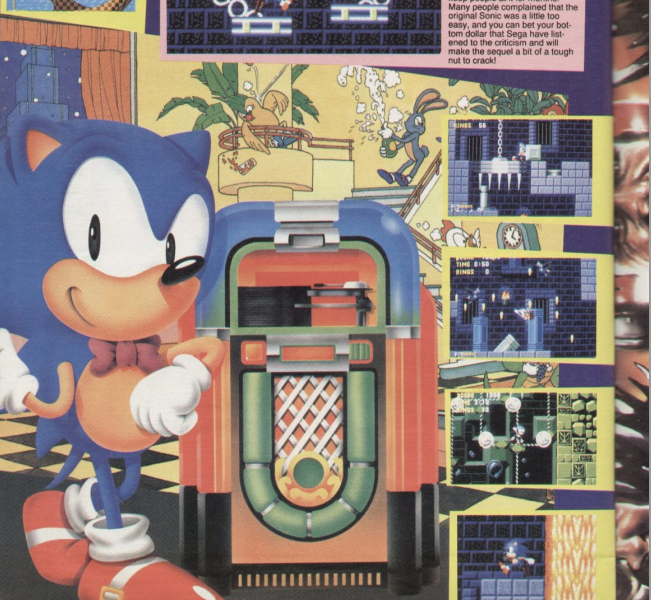 Mighty the Armadillo (SegaSonic the Hedgehog) – SEGA-AM3. This is the first real swerve off expectations. SEGA had multiple arcade divisions in the past, and they made this as opposed to Sonic Team. Mighty could feasibly be based off a concept armadillo we know of. 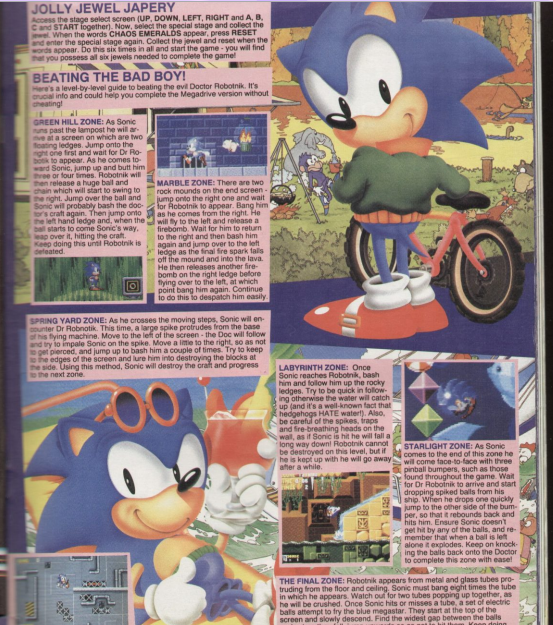 Ray the Flying Squirrel (SegaSonic the Hedgehog) – SEGA-AM3. 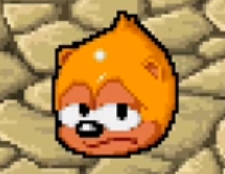 Some say he’s based off Tails concepts from Sonic the Hedgehog 2, but there’s no tangible proof of that as far as I know. Knuckles the Echidna (Sonic the Hedgehog 3) – SEGA Technical Institute. Again, less famous than Sonic’s and Tails’ creation histories, but we do know bits and pieces. For example, his very early concepts had him as a dinosaur, and after the Echidna bit was cemented he was green for a bit. Creator credit is given to Takashi “Thomas” Yuda. Fang the Sniper AKA Nack the Weasel (Sonic Triple Trouble) – Aspect Co. They were responsible for most of the Game Gear games, although most didn’t introduce new characters. He’s one of the few outsourced characters where we know where Fang’s creator credit lies for absolute certain; a freelance artist who calls himself Touma. He even used aspects of Fang’s design in some of his later works. Vector the Crocodile ([Knuckles] Chaotix) – SEGA Enterprises, although he is definitely derived from Sonic 1 concepts that were created by Naoto Ohshima. 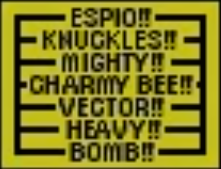 Charmy Bee ([Knuckles] Chaotix) – SEGA Enterprises. Like Amy, he is based off a 92-93 Manga character. Espio the Chameleon ([Knuckles] Chaotix) – SEGA Enterprises. 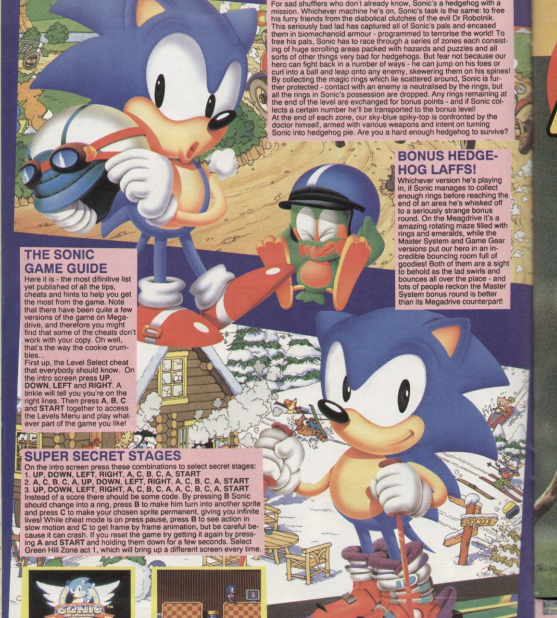 In early stages, the game appeared to have Espio in a more headline role based off the prototypes that have been discovered over the years. Makes sense since he’s an original character for this game, and it also justifies why he was picked out of the game for Sonic the Fighters. Heavy and Bomb AKA the Mechanix ([Knuckles] Chaotix) – SEGA Enterprises. We know nothing of these guys and they’re barely characters, more like walking handicaps. Bearenger, Fockewulf, Carrotia and Witchkart AKA the Villains of Tails’ Skypatrol (Tails’ Skypatrol) – SIMS Co. Ltd. One of the few Gamegear games not developed by Aspect Co. and a branch of SEGA that went independent about 2002-2004. No wonder it didn’t see an international release until 2005. The Battle Kukku Army (Tails Adventure) – Aspect Co. There’s two artists in the credits, and one of them is Nobuhiko Honda, who would later be responsible for the new characters and redesigns in Sonic Heroes, and the new characters in Shadow the Hedgehog. He also acted as enemy character designer in Sonic Adventure 2. That said, he was also an artist in Triple Trouble where he obviously didn’t design Fang so I wouldn’t count his future work as concrete proof he has credit for the Battle Kukkus. The Fang cameo that’s present in the game would be natural to expect given that he’s the company’s biggest contribution to the franchise. Do you know the homage origin of this polar bear? Answers on a post card please. Bark the Polar Bear (Sonic the Fighters/Sonic Championship) – SEGA-AM2. There’s one character designer listed in the credits, so it’s probable he was designed by Masahiro Sugiyama. He seems to be the only one not based on a previous SEGA-AM2 character, but I wouldn’t say it’s an impossibility. He went on to cameo in Fighters Megamix, Virtua Soccer and Shenmue. Bean the Dynamite (Sonic the Fighters/Sonic Championship) – SEGA-AM2. Like Bark, probable individual credit would be with Masahiro Sugiyama. Based on the protagonists Bin and Pin of Dynamite Dux. He shares the same cameo list as Bark. Honey the Cat (Sonic the Fighters/Sonic Championship) – SEGA-AM2. Again, probably credited to Masahiro Sugiyama. Based off Honey (Candy in the west) from Fighting Vipers. Her mirror form appeared in the introduction to the Saturn version of Fighting Vipers. Metal Knuckles (Sonic R) – Traveller’s Tales. There is a specified character designer though, and it’s…Yuji Uekawa? Yeah, some of the SEGA staff were advising and occupying roles in this, including head of Sonic Team Takashi Iizuka (as Game Design Director, with the Japanese personnel who had gone to STI in America now back with SEGA Enterprises in Japan since the production of NiGHT). It’s actually pretty easy to see considering how faithful to the franchises’ established elements Metal Knuckles is. While definitely based on the same design logic as Metal Sonic, he’s still British-made in terms of company. I think Sonic R is one of the first outsourcing jobs made by a company entirely separate to SEGA. Tails Doll (Sonic R) – Traveller’s Tales. Also presumably credited to Yuji Uekawa. One thing to note is that when asked about production of figures based on the Sonic R exclusives (Jazwares asked SEGA about Metal Knuckles), Jazwares explained that they don’t have the rights to some of the characters for the merchandise aspect as they were not developed SEGA of Japan. So despite Uekawa’s involvement, the developer took precedence here. Again, same design logic as Metal Sonic, only this time it takes on the form of a doll-like creation. Funnily enough, Sonic Adventure would show similar dolls of all three of the Triple Threat in mass-produced forms. But they’re not linked to this Tails Doll. What we can take from this list is that there is, by and large, a distinctive pattern between the classic characters who have gone to become hallmarks and those who have gone on to become scrap fodder. Most of the scrapped (not all) were made by one of the branches away from the central Sonic Team unit, with a couple being completely outsourced (on a developer level, anyway). This is all well and good, but then why were characters from SEGA Enterprises later brought into the Sonic Team fold, and how come others didn’t? Well, if we want to get to the root of things, we’re going to have to look at the game that’s the exception to the rule. 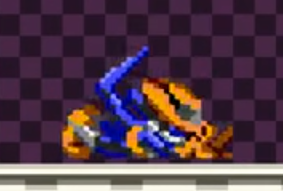 At the end of the day, Chaotix is quite the oddball hodgepodge of a creator mix. Ideas were taken from pretty much anywhere they could find once Sonic and Tails were decided to be off the cards, and as a result you have pedigree names mixed in with relative strangers. People who worked on the game at the time have explained the long work days and evenings crowded into a car eating takeout meals, which just adds to the strangeness. It makes sense when you consider this; at the time, most of the Sonic Team personnel that had been with Sonic 1 went over with Naka to America by the time Sonic 2 rolled around, so the Japanese side filled out their Sonic efforts with what remainders there were (Ohshima), and either brought in new staff (Hoshino) or dragged others in from non-Sonic branches (A few others). As such, the Chaotix are usually just written off as ‘unknown’ in terms of creator credit. But I truly believe it can be worked out, and quite easily. For this, we need two things; the Original Character Concept list taken ad verbatim from the credits sequence, and the list of character names seen on the level name cards that appear before you start a stage. Why is it double punctuated?? I don’t know!! Original Character Concept (do not steal). Takashi “Thomas” Yuda: Yuda is the one given credit for Knuckles’ creation in Sonic 3, and Knuckles is the most important character in the game, so it’s easy to guess that he was behind Knuckles the Echidna here too. 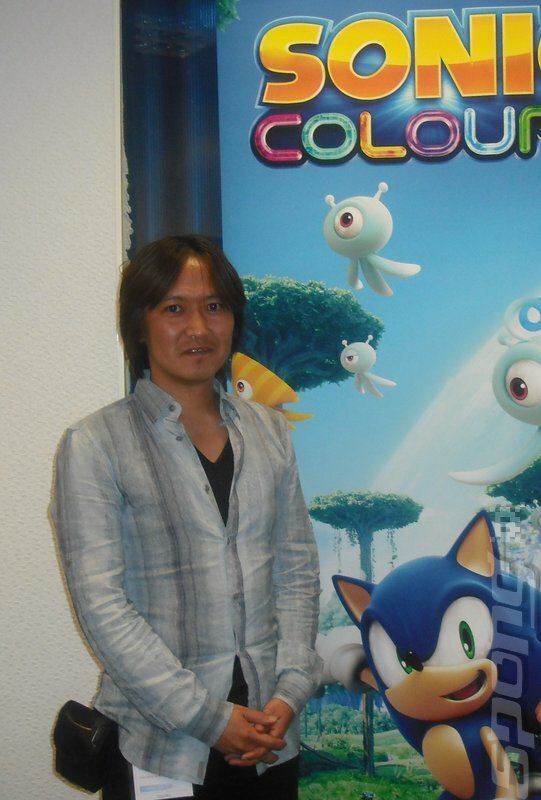 Manabu Kusonoki: Kusonoki has been in two other Sonic games, SegaSonic the Hedgehog (as a designer) and Sonic Adventure (as a CG movie director). Kusonoki is the only person SegaSonic the Hedgehog and Chaotix have in common, so it’s very likely he’s as much responsible for bringing in Mighty the Armadillo as he was for creating them both for SegaSonic the Hedgehog, which fits with the character list order. This does mean Mighty was the closest to getting in a Sonic Team game from a non-Sonic Team origin (I say close, because SEGA Enterprises isn’t quite there). Kazuyoshi Hoshino: Kazuyoshi is just another pen name for Kazuyuki (we know because Hoshino has talked about his experiences working on the game. His takeaway noodle anecdote is above) aka the guy who made Amy, who was based on a character from the CoroCoro Manga. And wouldn’t you know it, Charmy Bee also appeared in those same Manga. So out of those concept designers, he’s the one with the proven link back to it, thus likely also based Chaotix Charmy on that idea. Takumi Miyake (and Yasufumi Soejima). While Miyake doesn’t have many SEGA games to his name (five, apparently), he was everywhere design wise in Knuckles Chaotix. He was Chief Graphic Designer, Attraction Designer, Character Designer, Enemy Designer, Boss Designer and credited for Original Character Concept. That overlap into enemy and boss design makes me suspect that he was the designer for Heavy (as he was doing a lot of badnik designs regardless). The only other game Soejima has to his name at all is something called Dragon Force, so it would fit that he would do a simplistic design, which is what Bomb These both also fit the character list quite nicely. The first thing you’ll notice is the lack of any ground in this place. Notice the fangs? 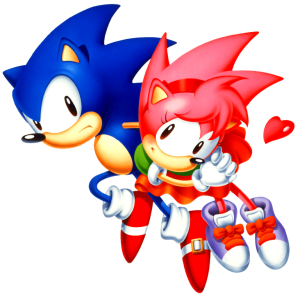 They were a hallmark of Ohshima’s early Sonic designs before SEGA of America came in a asked for them to be removed. It seems like it’s a common trait amongst his works. Speaking of that art, the other character on the page is unaccounted for, and just like the fangs, it links back to pre-Sonic 1 history. As is commonly known, there were lots of concepts banded about for the first game, one of which were characters made for a band to be featured in the soundtest and the intro/ending. Due to space and time restraints, these characters were cut and left as ideas. 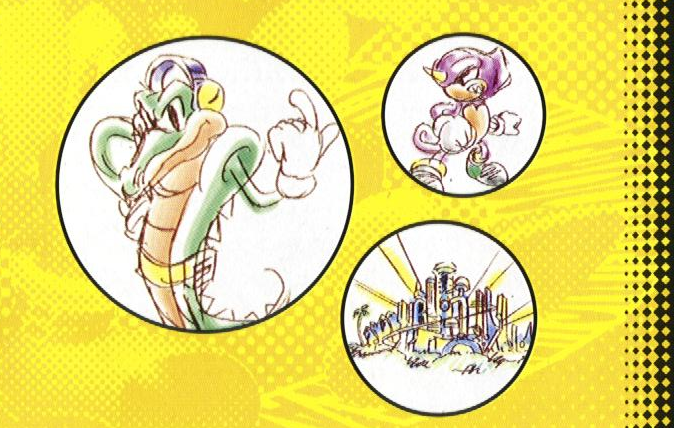 Now, these concepts, as such as Sonic and Eggman, were created by Ohshima as well, and since he was involved in Chaotix as is, it’s very likely that he revived Vector the Crocodile himself and readapted him for it. It would also explain why there’s one less original character concept credited than there are “playable” characters. Interviews with Ohshima have indicated that Sharps changed species during production, from a chicken to a parakeet. This colouring fits more for a parakeet, and heavily suggests that this was later in development and more finalised. This would apply to all of the characters. The bands’ dud have changed from matching Sonic’s red and white to blue and yellow. 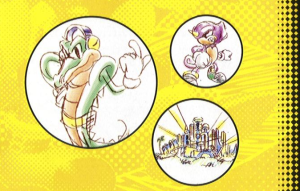 Considering that you can see a fraction of Vector on the right side in image 1, and he appears to have the yellow underbelly his Chaotix design would have, a hypothetical later concept Vector in blue and yellow would match the Chaotix design far more than the early concept. This is even stronger evidence that Vector was wholly Ohshima’s work if not much actually had to be altered for the official game design. Right, now we’ve done the listing part, it’s time to take a look at our possible options in terms of what it means for the scrapped characters. Option 1: The characters were cut for copyright reasons. I suppose since all the characters not used now are outsourced (or just insignificant, in the case of Heavy and Bomb), it’s technically possible, but I find it highly, highly unlikely to be the case. Even if their usage in the games since Adventure has just been old art assets, their image would come with a cost if they didn’t own copyright. And they wouldn’t let Archie have at them in their comic, because that counts as new material. Option 2: Sonic Team have a negative bias against non-Sonic Team creations. At least it’s somewhat more feasible than option 1, but it still seems far-fetched. How would they recall the origin of each and every one of them given that there’s at least a dozen to keep tabs on, while also focusing on the franchise’s current situation, and everything in between? I don’t think they’re that petty, especially when some of the possible creators were still with the series at the time of Sonic Heroes’ development (Honda has a big role there to boot), or are still active on Sonic to this day (Uekawa, who did cover art for the portable titles for a good while, and now puts out monthly official art on Sonic Channel). Option 3: Sonic Team have a positive bias for Sonic Team personnel creations. Now this one seems more in the realm of reality. Charmy is pinned down as Hoshino. 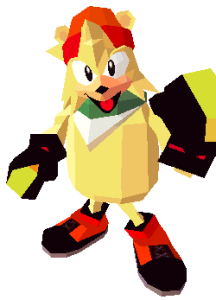 While he wasn’t on Sonic Team when he began at SEGA, he was folded into it by the time of Sonic Adventure, and in a fairly important role to boot, and he was . It seems natural that one of his creations would get preference. Vector and Espio meanwhile are pegged as Ohshima. 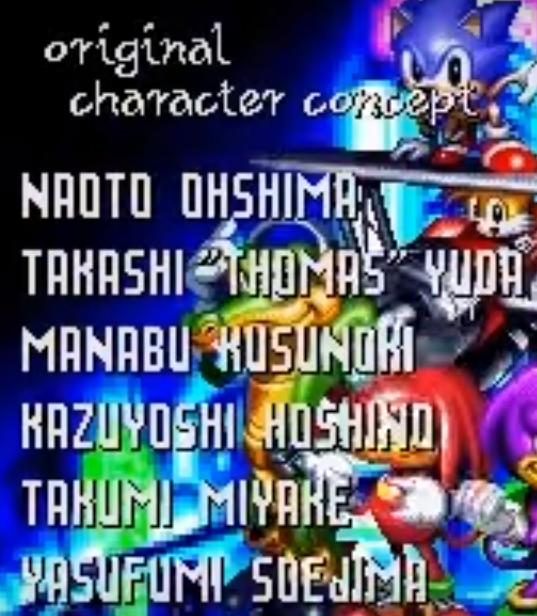 Ohshima left after Sonic Adventure, but he has the small credit of being the creator of Sonic as a character. Plus, both Hoshino and Iizuka seem friendly with him even after all these years. It would only be natural for them to want to keep what he made up to that point. Of course, they had to be retooled a bit because Sonic Adventure essentially marked a streamlining of the continuity which edged Chaotix out of canon, but they’re at least still there. So after all this, we’re essentially left with two overall conclusions, based on the above. The first is that we’ve had the information available to us to work out who made who in the Chaotix. Ohshima created Vector and Espio, Yuda created Knuckles (but that’s obvious), Kusunoki created Mighty, Hoshino created Charmy and Miyake/Soejima created Heavy and Bomb. The second is a heavier one; essentially, the Chaotix (the modern line-up, not the classic) always had a bit of an edge that the other non-main cast didn’t. Their creators weren’t just staff from other teams; they’re notable players in Sonic’s overall history. Citing the Chaotix as an example of when Sonic Team revived old characters and how it’s possible to do it again is essentially meaningless when they were always in the correct position to be brought back, it might have even been an eventuality as opposed to fortune. And with the aforementioned streamlining of the continuity with Adventure in combination, the scrapped characters will probably never get a look-in on being revived. Here lies Fang, the Cream the Rabbit of his time. So there we have it, we’ve covered creators, copyrights and Chaotix. Now, when do we start on Chaos, chili dogs and mint candy? All credit information is taken directly from their respective games’ credits. The information about Espio’s backstory is taken from the Japanese Chaotix manual.